Happy Friday all! I'm feeling kind of anxious today. My dance class is performing in a showcase with the whole school (kids, adults, professional ensemble) tonight and I'm pretty nervous. Wish me luck! 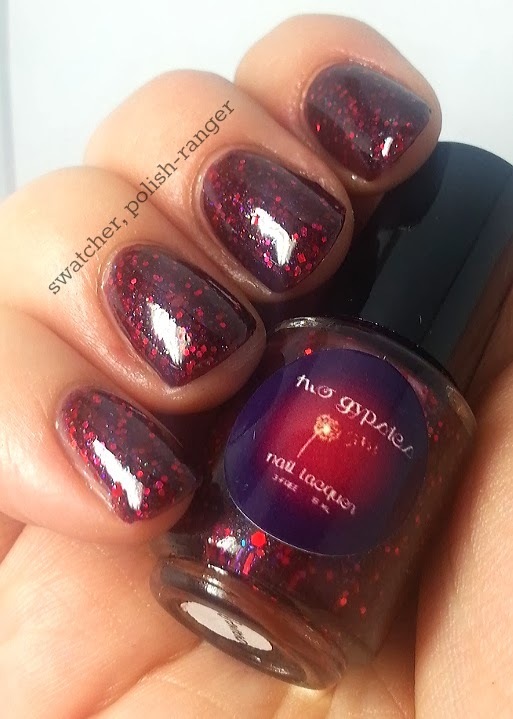 This one was sent to me as part of a Halloween Polish Exchange from the lovely Michelle of The Lazy Lacquerista. 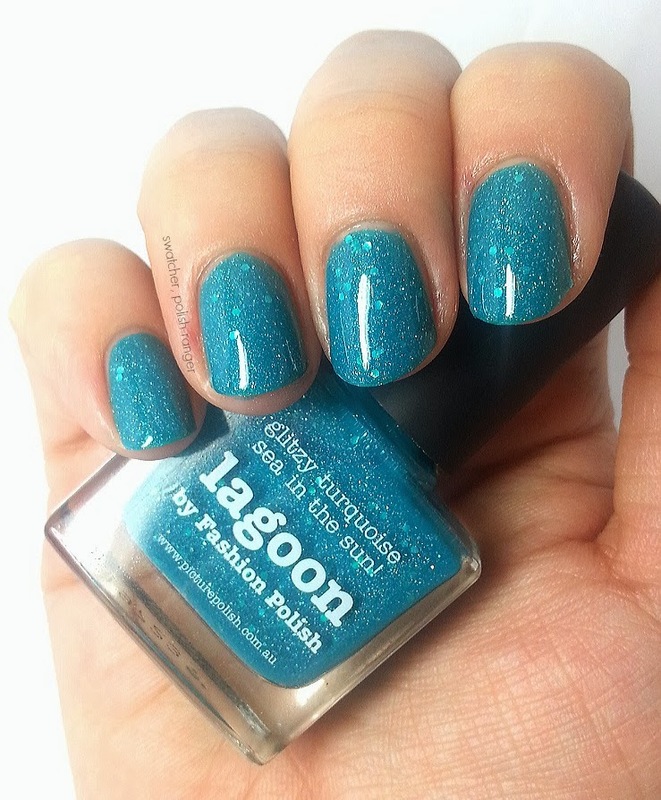 It had been a lemming of mine since it was released and since Michelle and I share a love of all things teal and turquoise, she was kind enough to scratch this one off my wish list. 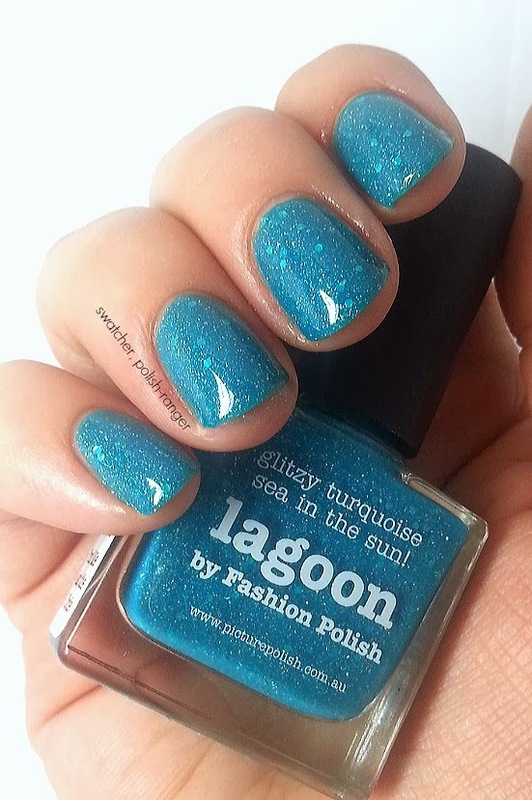 piCture pOlish Lagoon is from their blogger collaboration series and this was created in conjunction with Sam of Fashion Polish. 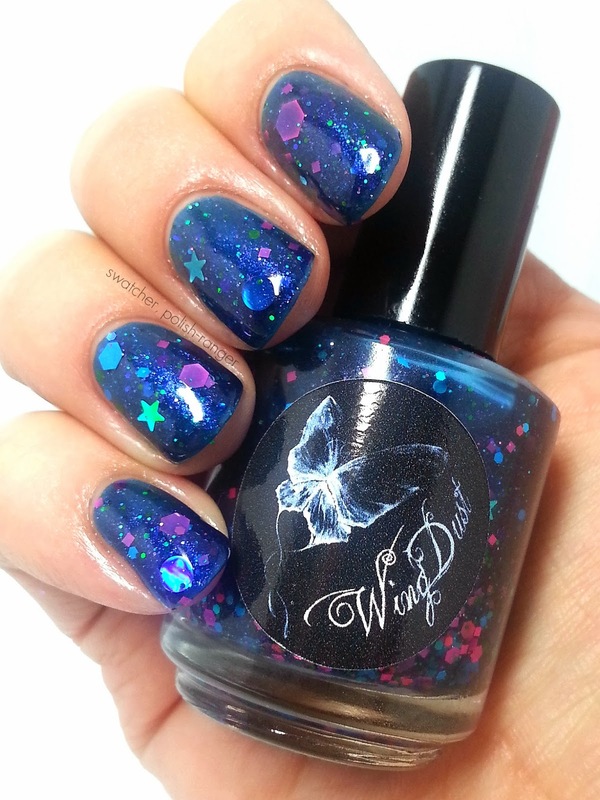 It contains pp's signature flecks as well as small glitter and scattered holo and the combination truly sparkles. The turquoise jelly base is PERFECTION - I love it so much. I find that some piCture pOlish shades can be quite sheer but this one was more pigmented and only required two coats. I also used one coat of Glisten & Glow HK Girl for extra shine. Gorgeous, right?! 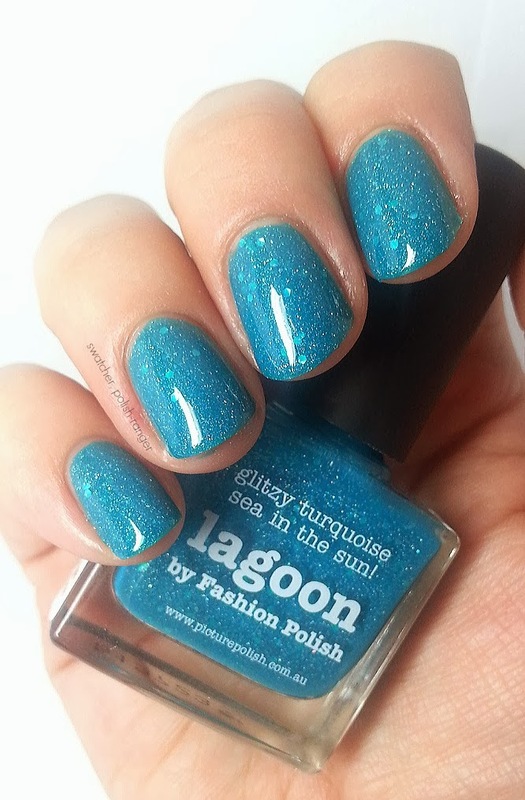 Do you have a favourite piCture pOlish shade? 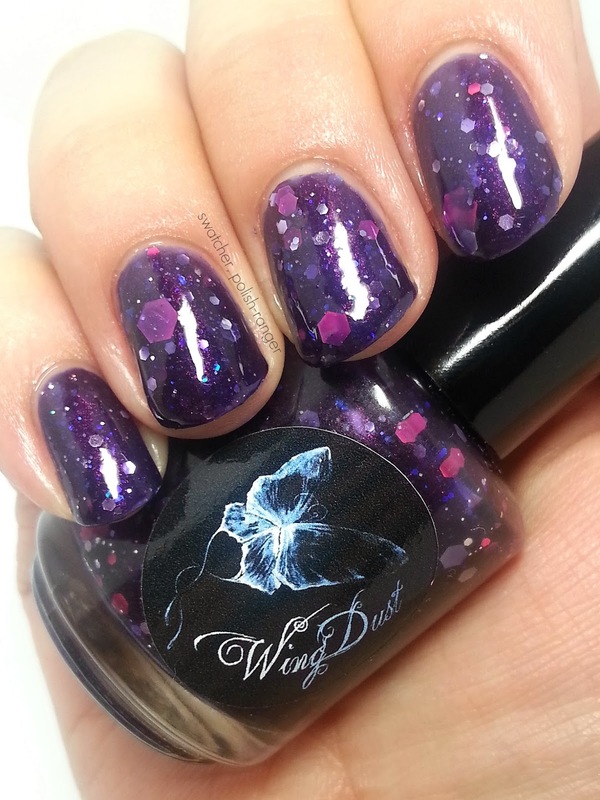 Today I have three beauties to show you from one of my favourite indie brands, WingDust Collections. I discovered Stephanie's Etsy shop last year when I was searching for gold leaf polish that didn't cost an arm and a leg and I fell in love. She is definitely not afraid of a good glitter bomb and her combinations are always so unique. I even had the honour of providing the name inspiration for Muskoka Sunset during one of her recent Facebook contests! When I submitted my most recent order, Stephanie was kind enough to send along three bottles for review purposes. All three of these are glitter jellies and, like most jelly polish, these take a bit of patience and the glitter needs a bit of help getting to the right spot on the nail. However, unlike most jelly polish, I found these three to be more pigmented, meaning I didn't need as many coats. In fact, for all three I only needed two coats along with some strategic placing of glitter. For all three I used one coat of essie First Base and one coat of Gelous. 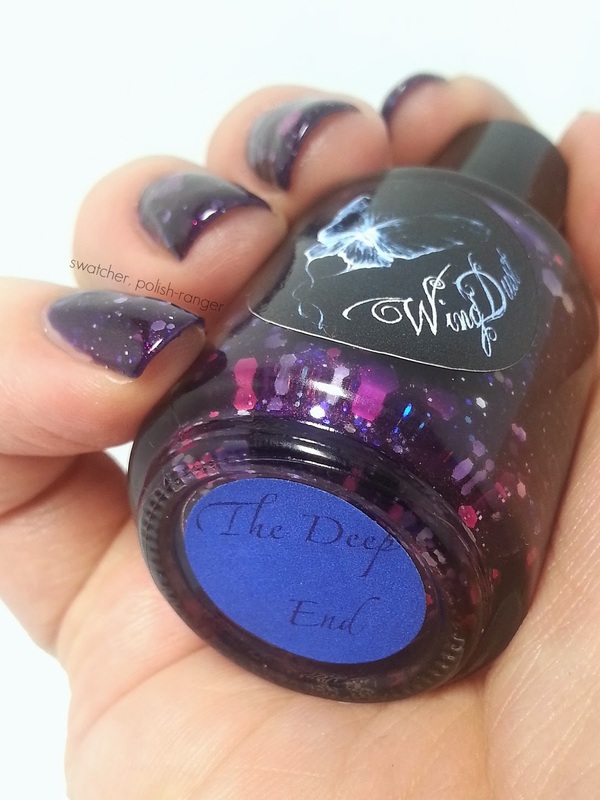 First, we have The Deep End which is a lovely purple jelly with various sizes of pink, blue and silver glitter. There is also a lovely copper shimmer that is visible on the nail. The large hexes required fishing. Next, we have Snakeskin Shoes (currently sold out), a blurple jelly that is loaded with small sized blue, purple and fuchsia glitter. 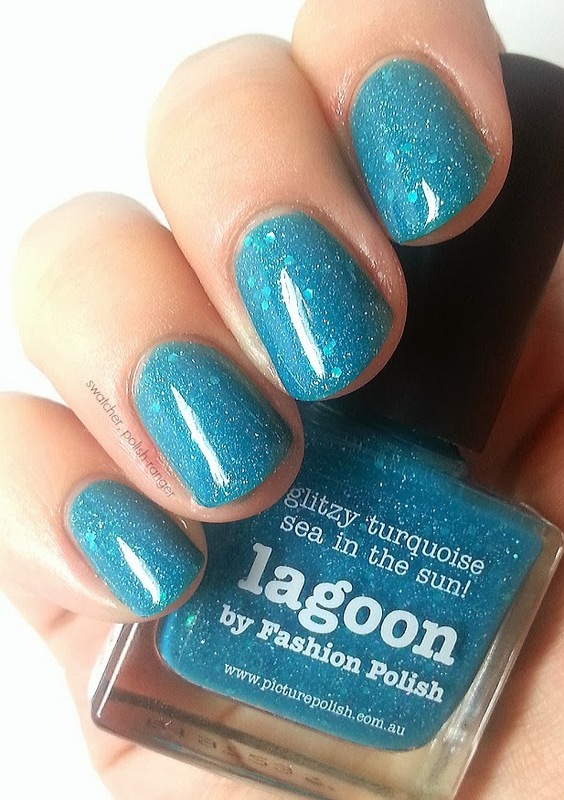 This one also has blue shimmer (love me some shimmer)! 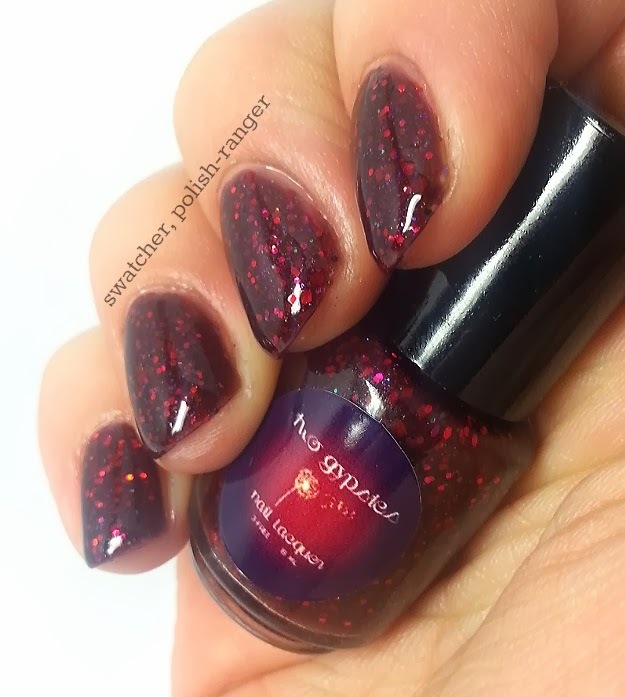 I had no issues with glitter distribution on this one and the jelly base is so richly pigmented you get gorgeous depth with several coats. 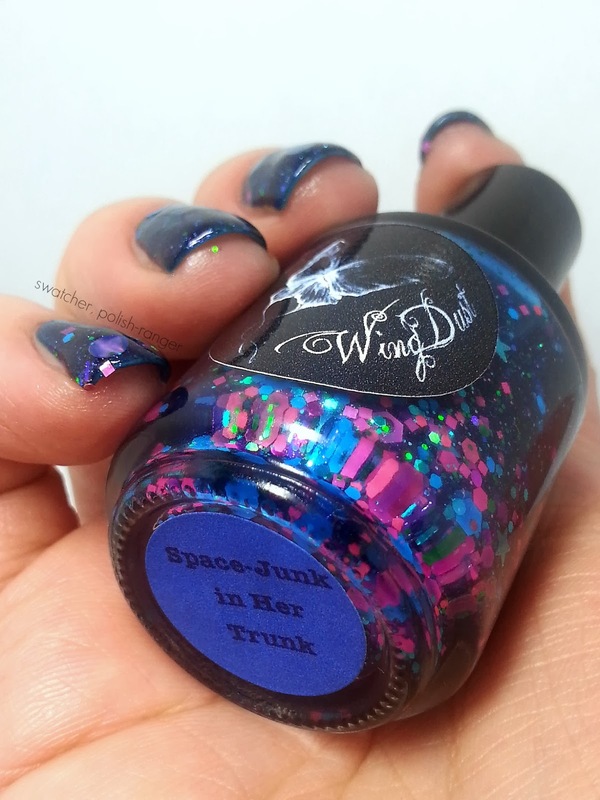 Finally, we have Space-Junk in Her Trunk (what a fun name! 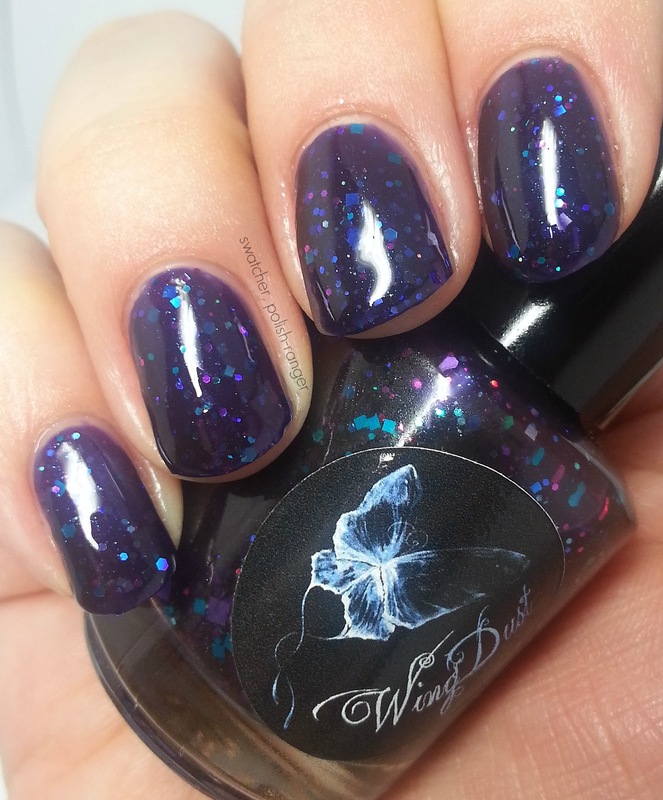 ), a deep blue jelly with purple shimmer that is packed with glitter in all shapes and sizes. There are circles! Hex! Stars! Squares! The list goes on. The large glitter in this does sink and requires fishing but I never mind this extra work because the end result is so amazing. Also, even though the hexes and circles are quite large, there are no issues with curling or sticking up on the nail. Again, the jelly base was fantastic to work with. Which one is your favourite? 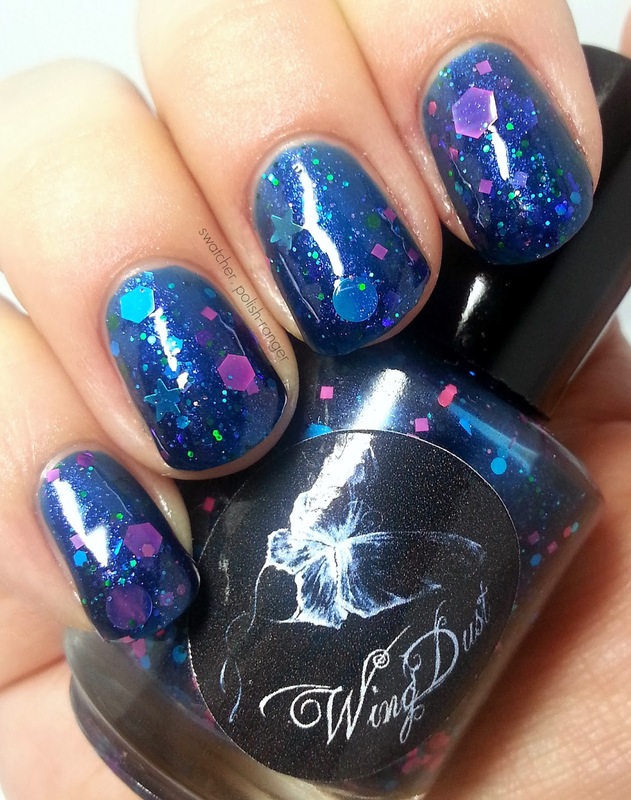 Of these three, Space-Junk in Her Trunk tops my list - the blue base is just so gorgeous! Today I have two colours from a new-to-me brand to share with you. Eat. Sleep. Polish. is a Canadian based brand who launched their first collection in November 2013 and they are quickly making a name for themselves. I know the creator, Caterina, from a Canadian beauty Facebook group and was super excited to support her new venture and give her products a try. 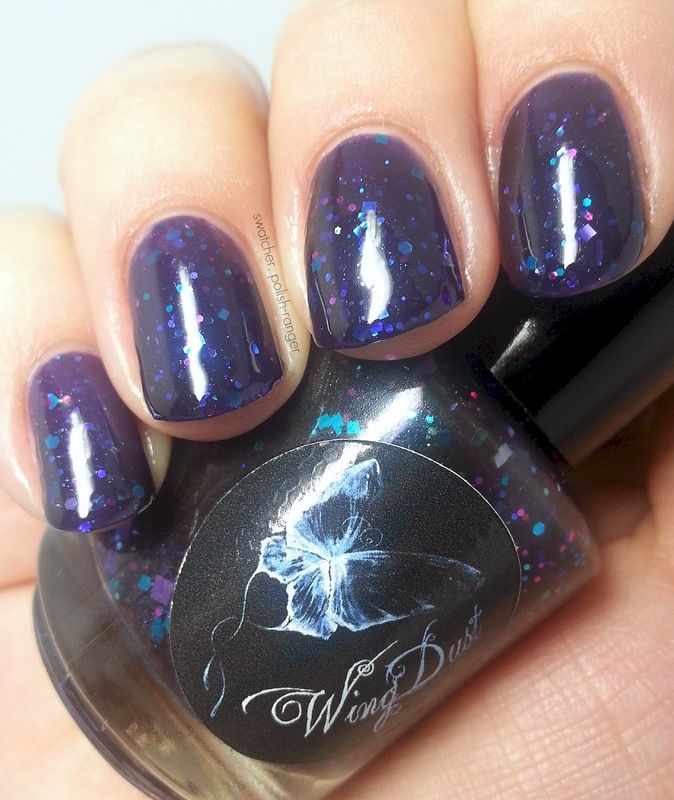 First up, we have Gaia which is "a scattered holographic, taupe-brown, foil polish." The formula on this was good - I had no problems working with it - and the end result is stunning. Since I live in the land of ice and snow and it's dark by the time I get home I didn't have a chance to try out the holographic properties but I love it just as a shimmery foil. Shown here is two coats of Gaia and one coat of Glisten & Glow HK Girl. The second polish I ordered is a glitter topper called Himalayan Salty Caramels. I'm going to admit that I bought this one purely based on the name. Salt & caramel? Yes, please! 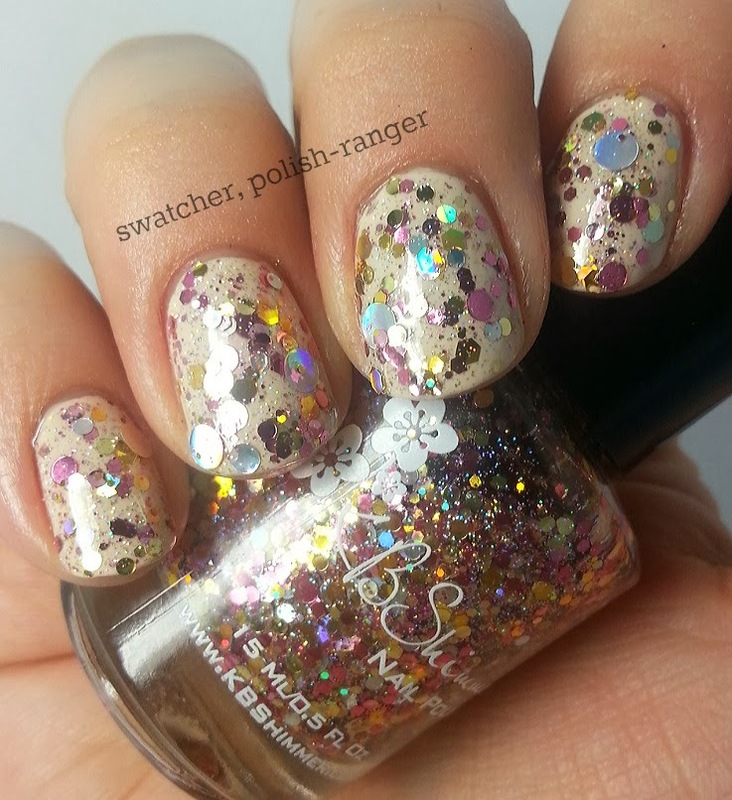 This topper consists of "gold, bronze, caramel & pink glitter of various shapes and sizes﻿" and it's lovely. I've really got a soft spot for all things bronze/caramel/brown this season and this is no exception. The base on this wasn't too thick and I didn't even need to use the dab method for placement. Shown here is two easy coats of Himalayan Salty Caramels over two coats of Orly Liquid Vinyl and one coat of Gelous. I was very pleased with both of these and will definitely be purchasing more from Eat. Sleep. Polish. in the future! Their Valentine's collection is currently available for pre-order. 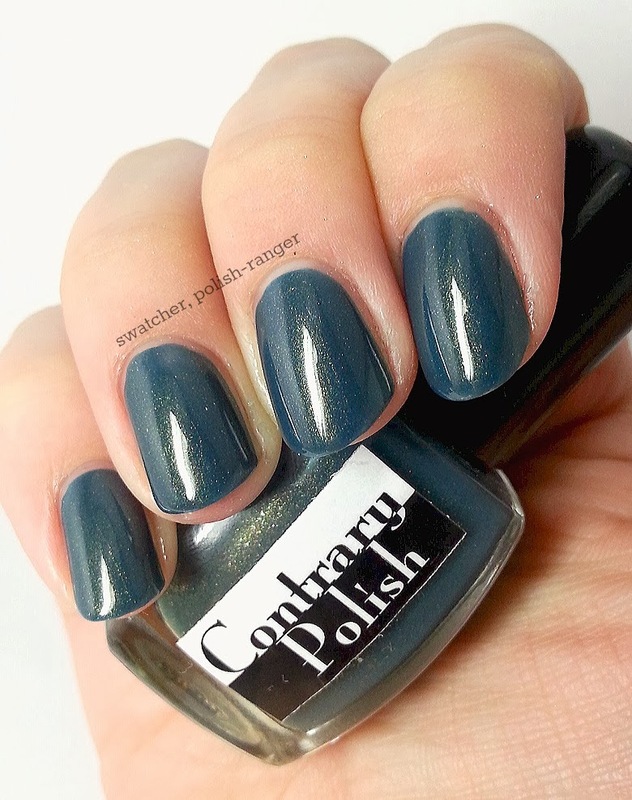 Anna Maria from Contrary Polish is a gorgeous dusty teal with the most amazing gold shimmer. 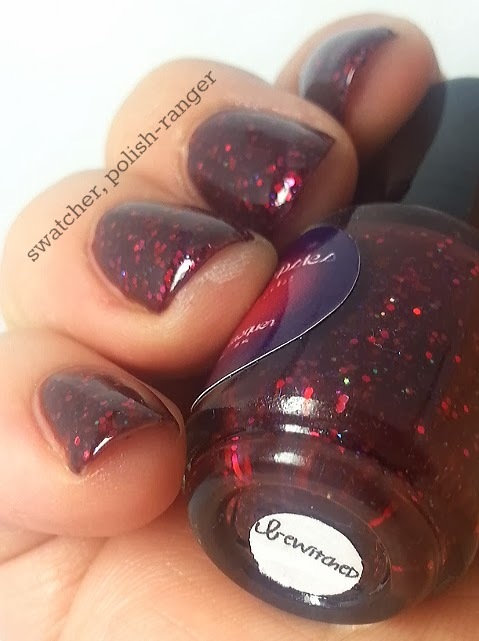 I've really come to love shimmers over the last several months and after trying Anna Maria I know that I need to BUY ALL THE CONTRARY POLISH! 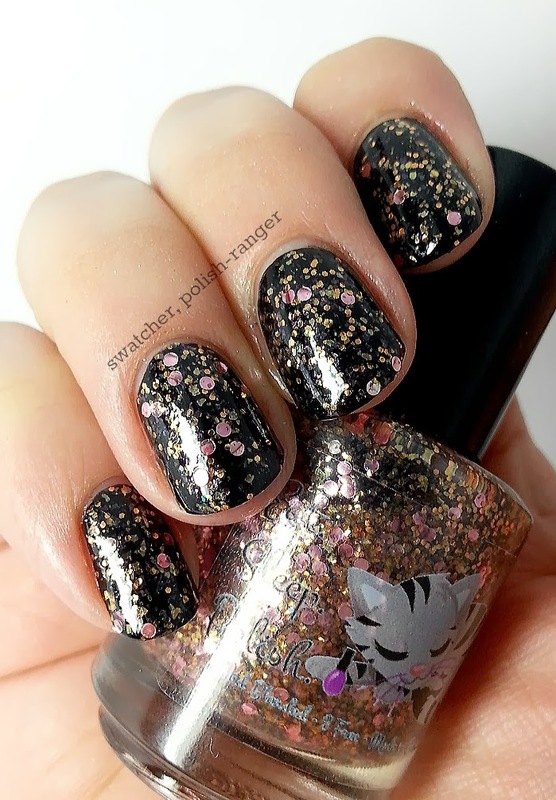 Carrie, the creator behind Contrary Polish, has really carved out a niche for herself by sticking mainly to shimmer polish and she definitely does it well. 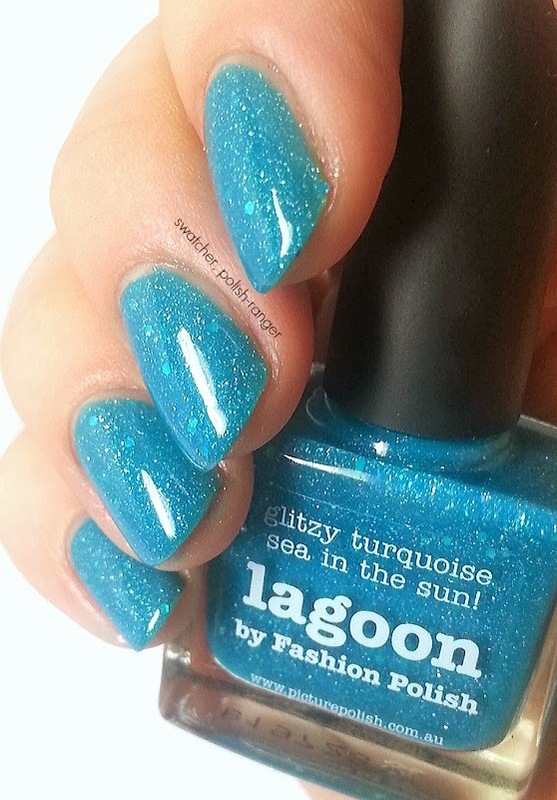 The formula on this was perfect - flowed on the nail smoothly and was opaque in two coats. My biggest pet peeve with shimmer polish is when the shimmer isn't visible on the nail but that clearly is not an issue here. I'm seriously in love! Shown here is one coat of OPI Nail Envy, two coats of Anna Maria and one coat of Glisten & Glow HK Girl. 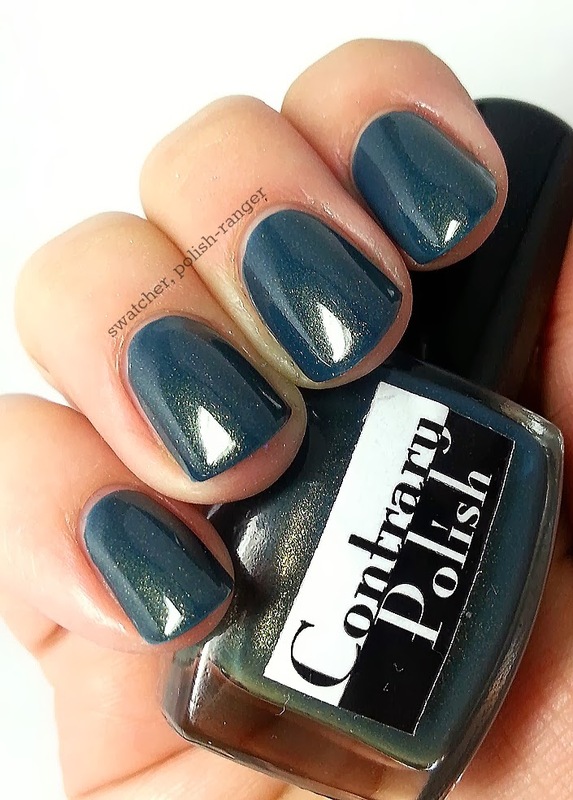 Have you tried Contrary Polish? Which one should I try next? You can see part one of this review here. 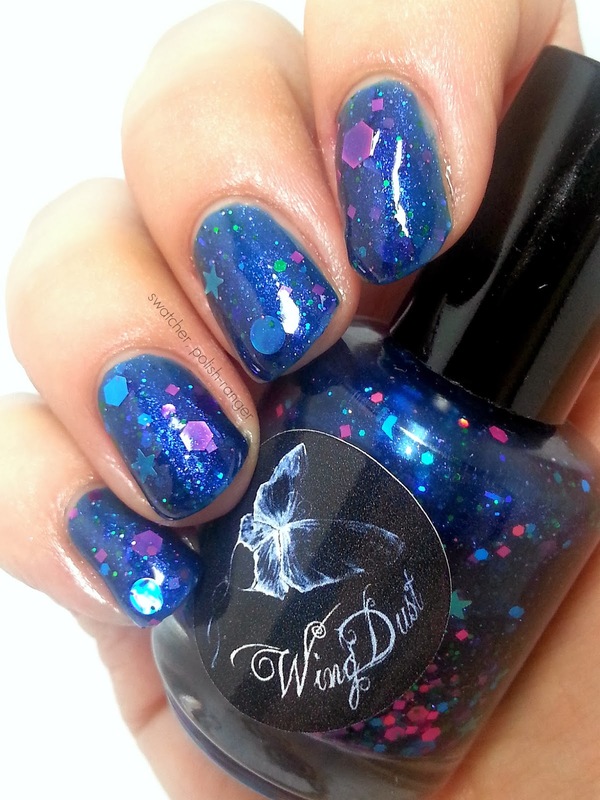 Today, I have the second part of my KBShimmer Winter 2013 Collection review. 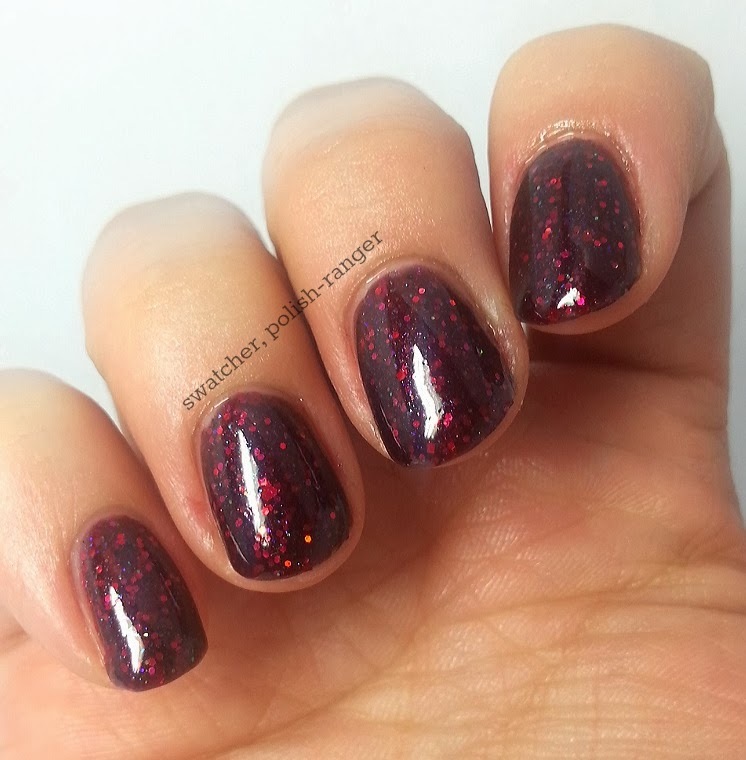 I'm going to show you three glitter toppers - one was the 2013 charity polish and two are from the blogger collection. 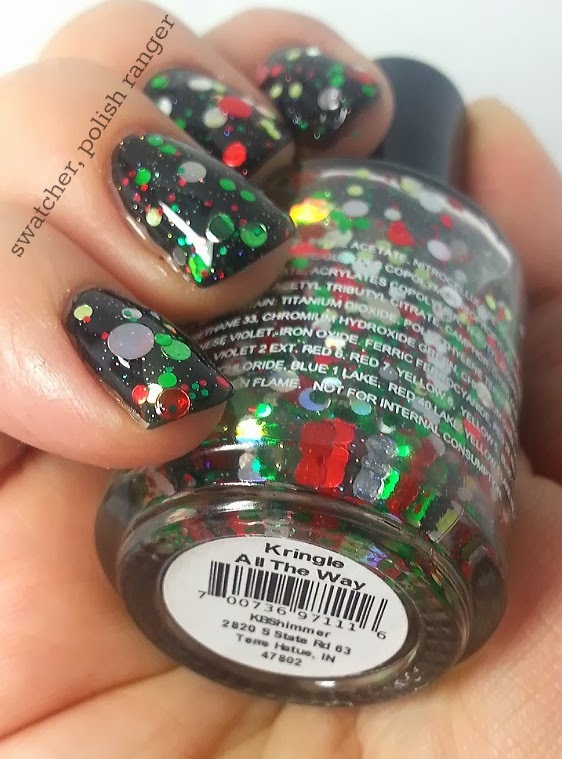 First up is Kringle All the Way, which was the 2013 charity polish. Christy used $4.00 from the sale of each bottle to purchase toys for Toys for Tots and this year $2968.00 was raised - that was 742 bottles sold!! 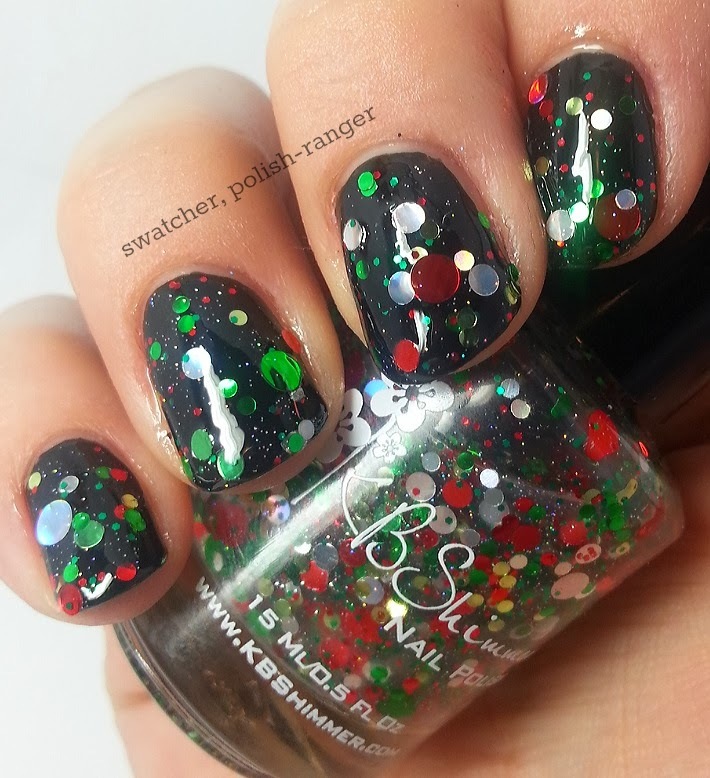 Kringle All the Way consists of green, red, and silver circle glitter of different sizes in a clear base. 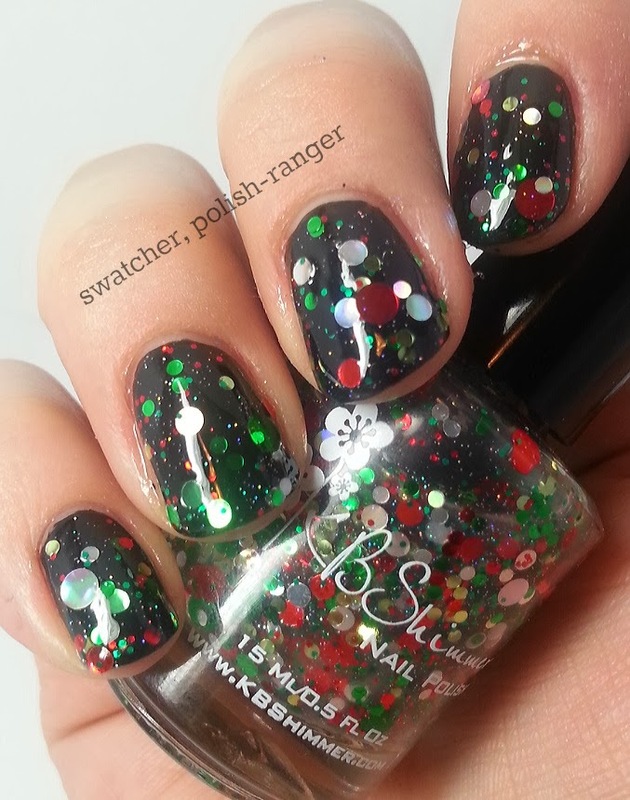 The glitter reminds me of ornaments and is the perfect Christmas glitter. Shown here is two dabbed coats over two coats of Orly Liquid Vinyl. The large circles did sink but it was easy enough to fish them out. 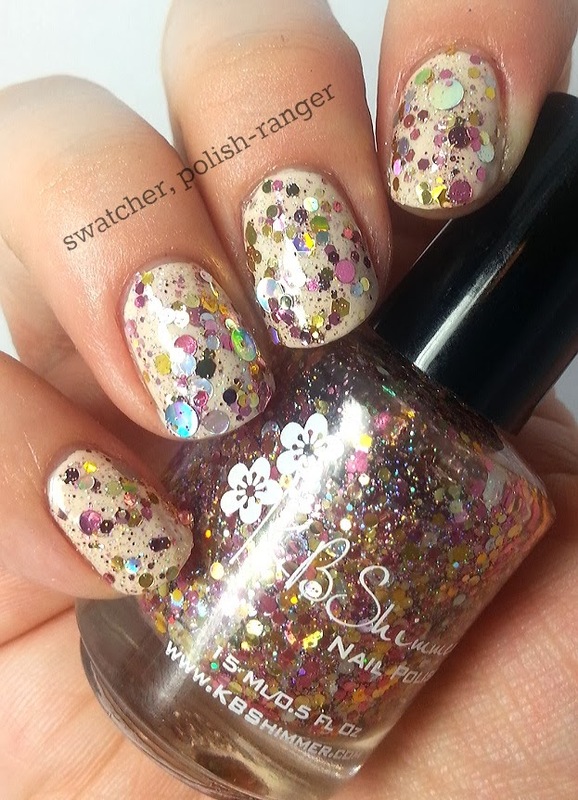 As with any glitter packed polish, the clear base of this is on the thick side in order to suspend all of the glitter. 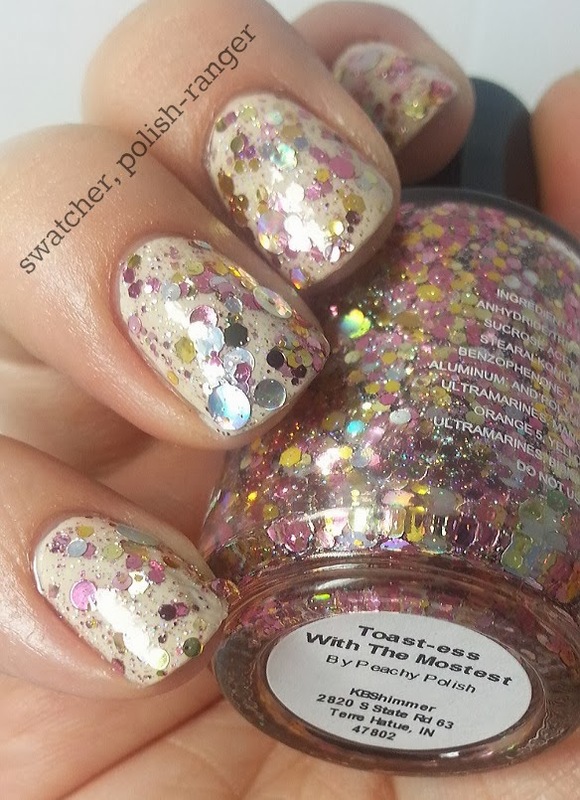 Next up is Toast-ess with the Mostess, which was a collaboration with Valesha from Peachy Polish. 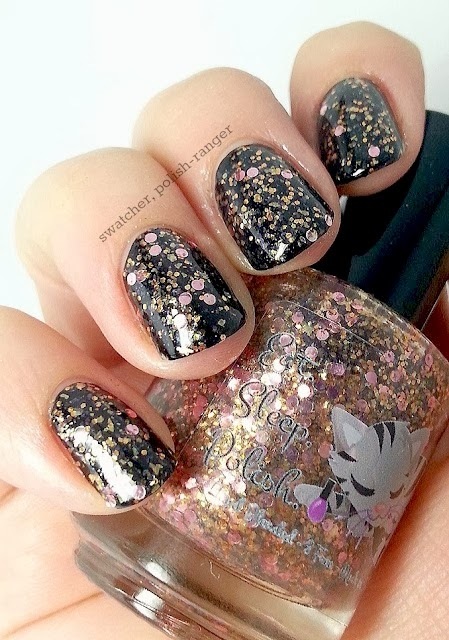 The pink, silver and gold glitter is supposed to be reminiscent of champagne and I LOVE the combination. This was perfect for the holiday season but also great for any time of year. A great way to be flashy and classy. (HA!) Shown here are two dabbed coats over two coats of OPI My Vampire is Buff. Again, the large circles were sinkers but, as you can see, easy enough to fish out. 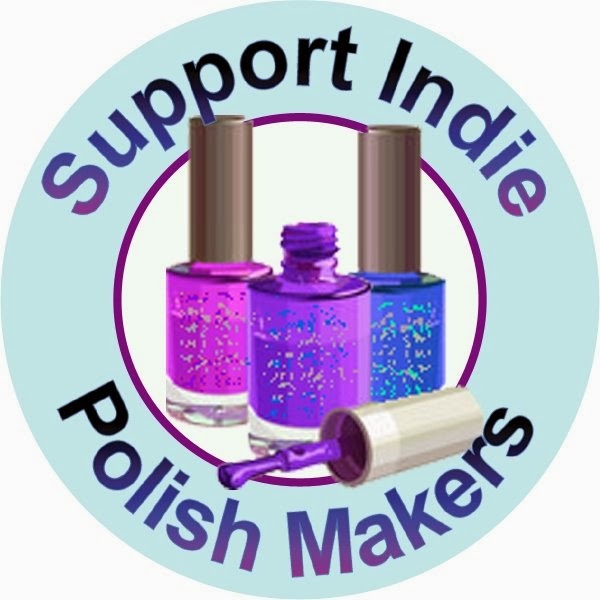 As with Kringle All the Way, the clear base of this is on the thick side so dabbing is the easiest way to work with the polish.. 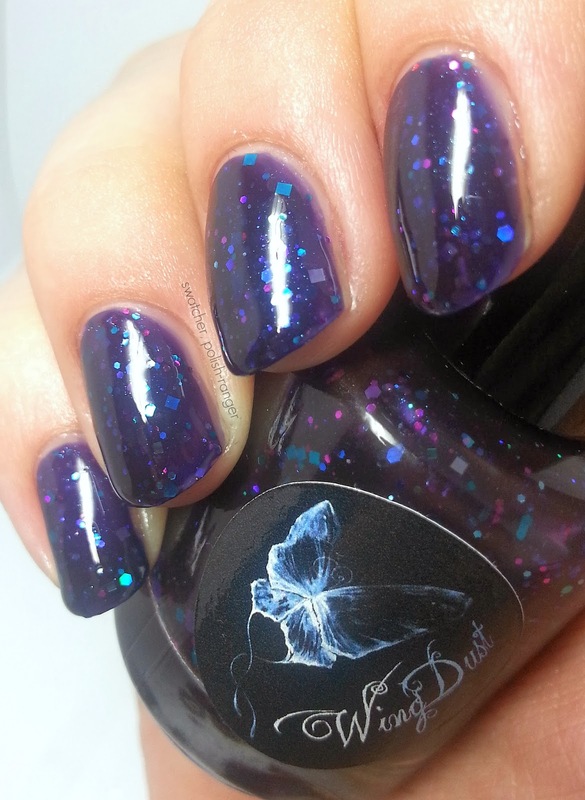 Finally, we have I Only Have Ice For You, which was a collaboration with Sarah from Chalkboard Nails. 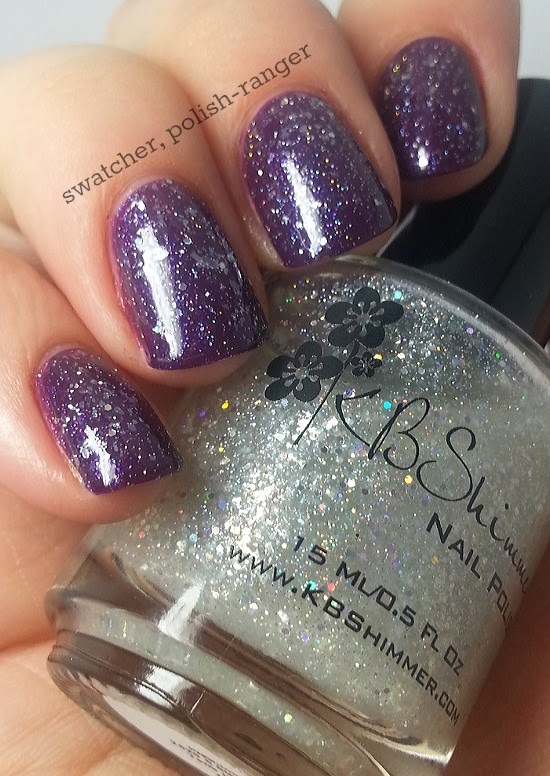 This topper is jam-packed with tiny holographic glitters and white flakes and Sarah said "it reminds [her] of a snowglobe" which I think is a great descriptor. It also reminds me of the days when the trees are covered in hoarfrost and the whole world sparkles. 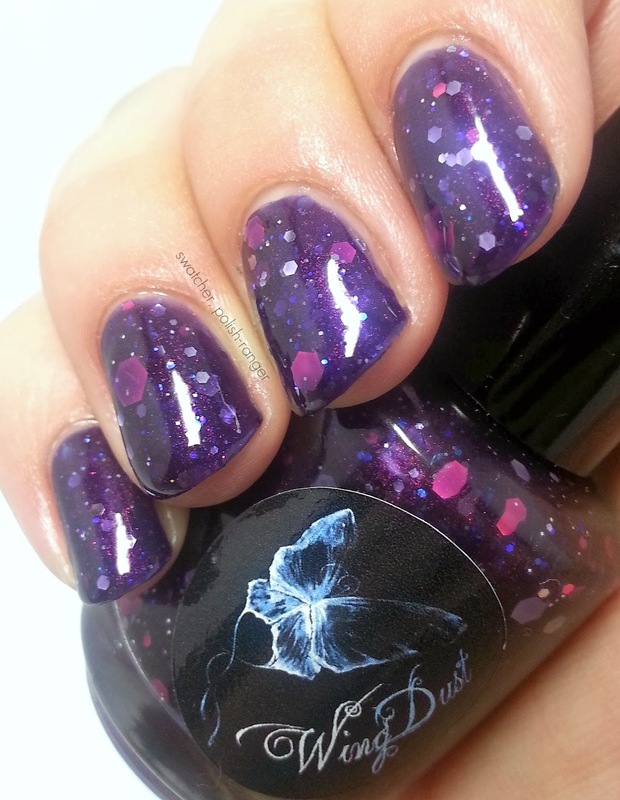 Show here is one easy coat over two coats of KBShimmer Plum Tuckered Out. That finishes off this two part review. Which one was your favourite? 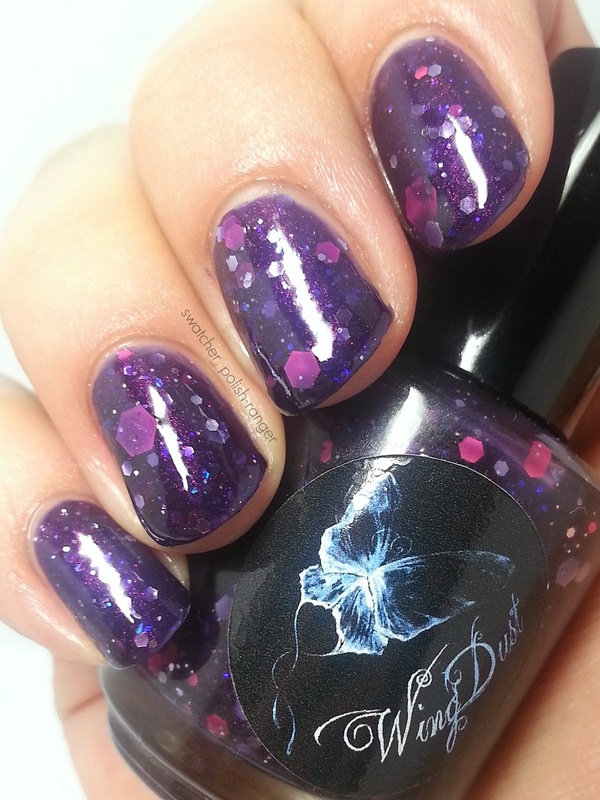 Two Gypsies Lacquer is a relatively new brand that came on to the scene with a bang. 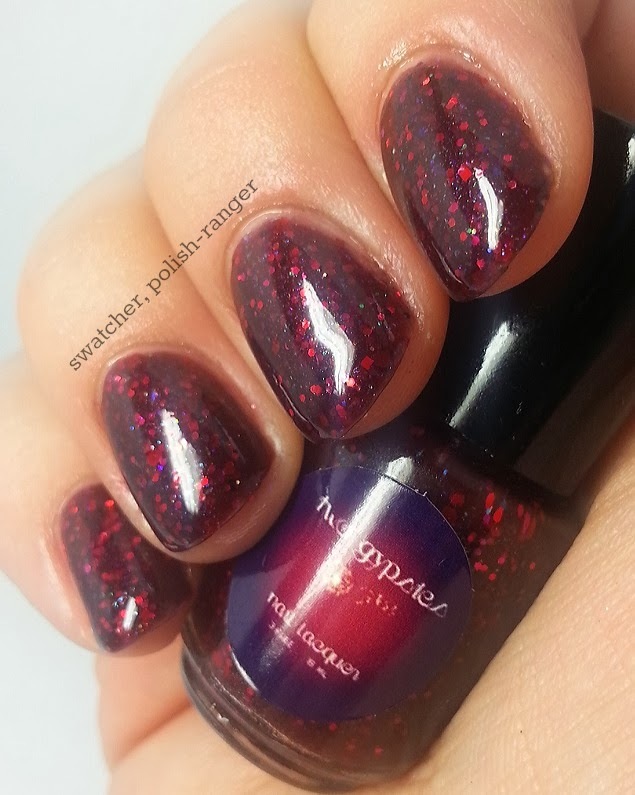 Michelle's first collection garnered a lot of interest and one of those colours, Chilean Chocolate, even ended up on several 2013 top polish lists! Up until now, Two Gypsies has only shipped within the US but Michelle has decided to dip her toe into shipping to Canada and I was lucky enough to be her first test. 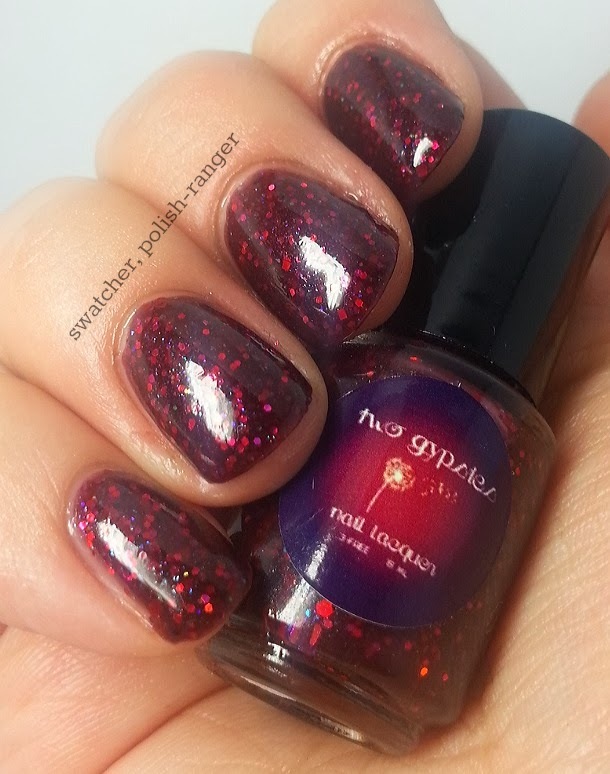 She sent me four colours to review and one of them, the one I'm showing you today, is from her upcoming Valentine's collection, to be released on January 25th. 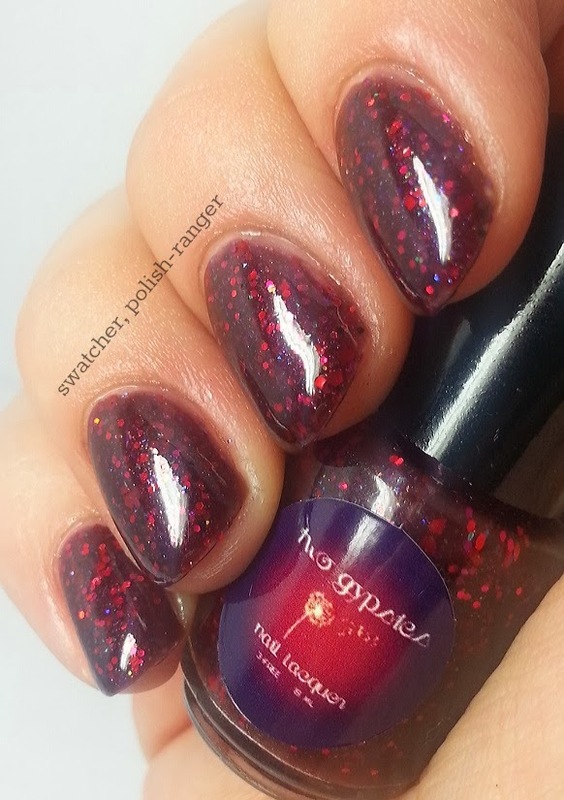 This is Bewitched, a dark red vampy jelly that contains different sizes of red and black glitter as well as a subtle blue/green/purple shimmer. The jelly base was nicely pigmented and the formula was a dream to work with. 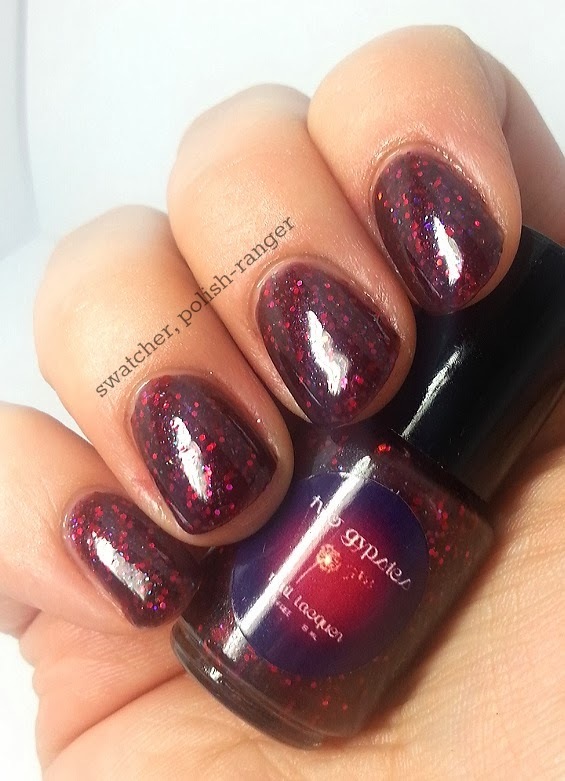 I am in love with the polish and think it is perfect for Valentine's Day without being a super bright red. Shown here is three coats of Bewitched and one coat of Glisten & Glow HK Girl. Two Gypsies' Valentine's collection will be available for purchase on January 25th.